Freescale approached InHand at the end of April 2015 with a new processor technology- the i.MX 6 single chip module (SCM). This SCM includes, in a single package, a fully functional i.MX 6 dual core processor (with the legacy MLB interface disabled), an associated power management IC (PMIC), 16 MB of NOR flash, and the ability to accept 1 GB of LPDDR2 via package-on-package (PoP). Looking to demonstrate the usefulness of the SCM technology and its ability to enable rapid time-to-market, Freescale sought InHand as an SCM alpha partner to provide a working design at Freescale Technology Forum 2015 (FTF 2015) on June 23, 2015. As an expert in minimizing time-to-market for our customers, we took on the challenge. A short time to market is often crucial to our customers to meet a mission critical need, hit a market window, or attain a first-to-market advantage. Often, the product design window is short, engineering teams cannot be fully staffed to assure timely design completion, and some types of design are outside the core competencies of the company. Any technologies and processes that relieve design time and complexity problems, while enabling product completion are beneficial to the design process, reducing cost, risk, and time to market. Traditional microprocessors require time consuming and complex schematic capture and printed circuit board routing. A basic microprocessor system typically includes the microprocessor itself, multiple DRAM ICs, power control circuitry including a number of voltage rails and associated switching circuitry, and complex circuit board routing to interconnect it. Complex microprocessors, such as the i.MX 6, are usually implemented in high density ball grid array packages with hundreds of balls. For example, there are 624 balls on the package utilized by InHand’s existing Fury-F6, based on the conventional i.MX 6. A 64-bit DRAM memory interface on the i.MX 6 requires 120 of these balls for address, data, chip select, byte select, clock, control, and other signals. In addition, there are peripheral interfaces that must be routed to make the processor useful and the power system routed for low noise and low impedance. Th e conventional i.MX 6 power tree requires 11 voltage rails spread across 188 processor package balls (including grounds). Each rail has different current and impedance design targets, which impact the circuit board design, including requirements for copper pours, bypass capacitors, filtering, and via structures. This can be a complex and time consuming task to satisfy all design constraints because, simply put, the more stuff there is to worry about, the tougher the problem and the more time it takes to solve. A number of other challenges increase the time and complexity of these designs. DRAM routing between DRAM ICs and the processor has similar challenges. It is often time consuming and still ends up being the source of difficult to solve circuit bugs. Length matching is required within various signal group types (such as data lines, clock lines, etc.). Trace-to-trace spacing and parallel routing must be considered carefully to prevent signal crosstalk which could induce data errors, which often occur intermittently and can be very frustrating to debug. In most applications, the microprocessor system is a means to fulfill an application, but is not the main goal. In other words, the product uses the microprocessor system as a tool, but the value added is often an added peripheral or software running on the processor. Therefore, it is more efficient to utilize a microprocessor system that already exists or is easy to implement. Freescale’s i.MX 6 SCM partially solves the time-to-market challenge by providing an i.MX 6 microprocessor, PMIC, NOR flash, and DRAM in a single package. These essential elements of the board are already interconnected without the need for circuit board routing, which immediately cuts down on design time. The SCM additionally incorporates hundreds of components, such as bypass capacitors, and connections that otherwise would be implemented on the circuit board. This on-module integration not only saves design time, but also improves performance by eliminating the package inductance present with circuit-board mounted bypass caps. With its massive integration, the i.MX 6 SCM saves a large amount of printed circuit board space. The SCM package outline is 17 mm x 14 mm, just 54% of the board area taken up by Freescale’s discrete i.MX 6 dual core package of 21 mm x 21 mm. The small size of the SCM processor system enables ultra-compact product applications. With these advantages, InHand sought to produce its latest SBC, the Fury-M6, within a very tight seven week time frame. Being a new circuit board, this included: up-front system design, schematic design, circuit board routing, board assembly, and debug. This also included the development of a Linux BSP. An additional design goal was to minimize the footprint of the Fury-M6, utilizing the size advantage of the SCM. Within a week, InHand finalized the Fury-M6 architecture, which is shown in the SCM-i.MX 6Dual block diagram, right. The goal was to make the size of the Fury-M6 circuit board 6.25 in2 or less. This goal was met, as the size of the Fury-M6 SBC measures just 2.75” by 2”, or 5.5 in2. InHand also sought to take advantage of the small size of the SCM footprint by adding more functions within this area, such as Wi-Fi, Bluetooth, display interface, and sensors. InHand completed the schematic within two weeks after the architecture was finalized. This required two engineers simultaneously accomplishing the schematic design. Once that step was completed, a preliminary part fitting exercise enabled the hardware team to converge on a target printed circuit board size of 2.75 in x 2.0” footprint, yielding a board area of 5.5 in2 – or 12% less than the 6.25 in2 target of the previous generation Fury-F6, while adding an additional 11 features. The area required for the added circuit functions was facilitated by circuitry already present within the SCM package. The processor related circuitry on the new Fury-M6 requires only 35% of the circuit board area required by the equivalent circuitry on InHand’s predecessor Fury-F6 SBC. This 65% area savings in the processor block opened space to implement the additional peripheral features. To accelerate design completion, the PCB layout of the Fury-M6 was initiated in parallel with the completion of board schematics. The SCM enabled a great deal of routing efficiency; removing 99% of DRAM-related pins and 67% of power supply related pins. While the Fury-M6 and Fury-F6 boards have essentially the same number of component placements (436 vs 440, respectively), the SCM-based Fury-M6 has 23% fewer routed nets and 52% less total trace length. The fewer nets and decreased trace length open up trace routing space that allows greater trace spacing, lowering crosstalk risk and enabling routing to proceed faster. Or, the designer can potentially implement smaller board outline if tighter trace spacing is maintained (but not so tight that crosstalk or manufacturability problems are introduced). The reduced net count and trace length also reduces the number of vias required, further opening up routing space. Once schematics and layout where complete, the PCB fabrication and circuit card assembly were accomplished on an expedited turn in order to meet the deadline for FTF 2015. Once board assembly was complete, InHand brought up and validated the Fury-M6 within just one week. The amount of validation work required was less than for the existing Fury-M6. The accelerated bring up time was due, in part, to the DRAM and PMIC, which were integrated into the SCM. This integration meant that the DRAM and PMIC where already tested by Freescale; traditional tasks, such as the tuning of DRAM interface timing and running a DRAM stress test were not required. The Linux BSP required by the demo (and demo software) was pre-tested on the existing Fury-F6 platform, as well as Freescale’s SCM evaluation board, further saving time during the bring-up process. 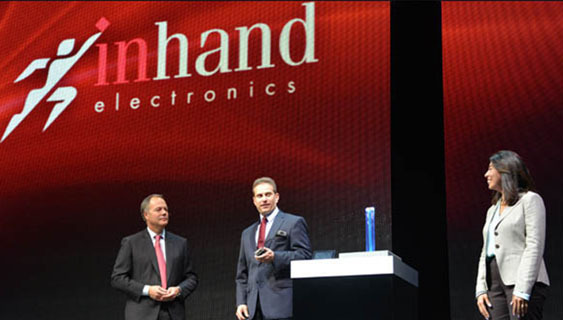 InHand introduced the Fury-M6 live during the FTF 2015 keynote address. The functional demo (pictured, right) consisted of two Fury-M6 units communicating via Wi-Fi. The first Fury-M6 unit consisted of a board mounted between two pieces of open Plexiglas, which streamed via Wi-Fi video from a connected USB camera to a second Fury-M6. The second unit was a small Fury-M6 based tablet complete with custom enclosure complete with integrated touchscreen display. The tablet received the streamed video and displayed it on its LCD. The time from start of the Fury-M6 system design to the on-stage demo was also seven weeks. The Fury-M6 design was completed within the short seven week window from kickoff through the FTF 2015 product announcement and demo. The Freescale SCM enabled this fast time-to-demo through its integration of critical microprocessor circuit, including the CPU, DRAM, NOR flash, and power management functions, decreasing the complexity of the schematic and circuit board design. The Fury-M6 also realized its board area design goal, achieving an outline of 2.75” x 2.0” (12% less than the target) while simultaneously adding 11 new major circuit features. InHand demonstrated its rapid time-to-market design capabilities, utilizing the SCM to reduce the amount of work required and risk incurred. The Fury-M6 is ideal for extreme space constrained applica¬tions that require local processing power, complex operating systems, or high performance graphics. Its wireless capabilities enable Internet of Things (IoT) applications while its graphics/display features allow for portable hu¬man interaction. Example applications include: Portable medical diagnos¬tics, autonomous vehicle/UAV control, portable cameras with image analysis, and industrial sensors with data analytics. For customers with specific product requirements, InHand’s engineering services can modify the Fury-M6 or create custom carrier boards for the Fury-M6 to meet specifications. Click here for all InHand white papers and case studies.